The last thing that Melissa's father told her was that it takes glass a million years to decompose. But while it may seem to her that glass lasts forever, Melissa's family is falling apart. Her father is taken by cancer, her sister acts like Melissa is a freak, and her mother is moving on with her life with her new cowboy boyfriend. And now, her best friend Ryan seems more interested in his new girlfriend than their friendship. Through it all, Melissa must learn to recognize inner and outer beauty and realize that sometimes, you can have both. 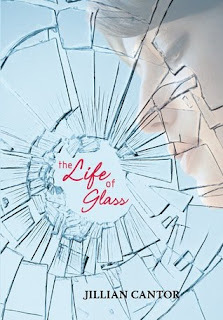 The Life of Glass is a very sweet, poignant coming-of-age novel that chronicles Melissa's journey as she attempts to live her life after the death of her father and learns to be comfortable in her own skin while living with her beauty queen mother and sister. As with her first novel, Jillian Cantor handles the many tangled emotions of grief and loss in a sensitive, skillful manner, making her characters come alive, and putting her audience under a spell at the same time. The Life of Glass deals with those basic, tough issues of growing up and moving on: making friends, dealing with guys, and finding your comfort zone. Cantor's second novel is sweet, sensitive, and compelling; Melissa will make you remember things about growing up you probably have forgotten. Cover Comments: I like the blue color of this cover! It's very pretty. and the shattered glass seems quite appropriate as well. I don't see as there is anything that makes this one really stand out, but is is very nice. The Life of Glass will be available from HarperTeen on February 9th, 2010! I'll have to take a look at this one, since everyone seems to want slightly depressing books right now. The cover is really nice. Oh I know, what is with that? Mhy next read is gooing to be a comedy or thriller! And Casey, there is Scribbler of Dreams by Mary Pearson, or if you are looking for something a little more unconventional, Saving Juliet by Suzanne Selfors. That's all I can think of at the moment, but if you need more, email me with an email address I can email you back at. I hadn't heard anything about this book - I love the cover!